I am listening to a sublime, natural, entertaining, minimal system in my Brooklyn apartment… and loving every minute of it. My room has come alive! The system consists of the German-designed Bastanis Prometheus Black loudspeakers, American-designed Red Wine Audio Clari-T amplifier and Chinese designed Original CD-A8T tube and solid-state CD player. There’s a lot here that’s new to me. I am experiencing audio gear that I don’t think I would have explored without the opportunity of doing so as a reviewer for Dagogo. Soon after I started writing for Dagogo.com, I started to build a list of products that I thought would be interesting to experience. My list is fairly well spread out across electronics and loudspeakers, with a focus on the affordable (under $5k) and a focus on the lesser known. A few months ago, I saw a show report from the RMAF and saw a beautiful pair of Bastanis speakers that had a very positive response from those who heard it. Those speakers were the Bastanis Apollo’s and they were out of my target price range. But upon exploring the Bastanis Web site, I noticed the Prometheus speakers were available in kit form for around $2k. I fired off an email and got an immediate response from Robert Bastanis, the designer. Robert was very nice and quickly put me in touch with Bill Allen, the US distributor. Bill told me how he was just starting to sell assembled Prometheus speakers. Good for me, because I am the least handy person you will ever meet. Let’s start (and end, you’ll see) with the speakers… The Bastanis Prometheus speakers come in a few assembled configurations at a few different price points. The Bastanis Prometheus Black … fully assembled at $3750. If going for assembled subs only, where you assemble the upper baffles and pay only $3200. The Prometheus kit, all drivers, bass amps, wiring & plans… no wood goes for $2200. What I am reviewing here, as part of the Red Wine Audio Clari-T amplifier and Original CD-A8T CD player system, are the $3750 fully assembled Bastanis Prometheus Blacks. They are called the blacks because they are a semi-mat, black painted MDF (medium density fiberboard) set. No wood in sight. Many, many wood options are available at extra cost, and I’ve included many various photos of different woods to give you an idea. Thanks goodness these are offered/came assembled. Although Bill told me that only basic assembly and wiring skills are need, I’d rather not illustrate my handy non-ability. Shortly after moving into my new new house in Philly, I had to get a phone cable from my son’s bedroom to the adjacent office. Would seem simple, as I had only to drill through the wall and feed the cord. So I used this wiring drill bit that I bought special for the occasion. The bit is 1 foot long, so I figured I’d have no problem getting through my old thick walls. Thinking I knew my house, I just moved my son’s bed to the side and started drilling. Pushing the drill through, all of a sudden the resistance stopped and the complete drill bit pushed all the way into its end at the drill. I pulled it out and saw daylight. Yep, that’s right… daylight. I drilled right through the brick exterior of my house. I didn’t think and realize that my house took a small turn in at that corner. Whoops. So I figured I would just go into my office and drill back into the bedroom and everything should be fine. This time I encountered a lot a resistance and then the bit got stuck. When I would trigger the drill, the whole drill would turn and was stuck . I went into my son’s bedroom to see what was up, and to my wife’s elephant-like memory was engrained this story. You see, I ended up drilling through the wall, through the bed cover, through the bed frame and into the mattress, of which the drill bit got completely tangled up in all of that stuff. I forgot to move the bed over before even more due to the “L”-shape of the house I just discovered. My wife had to patch the bed cover. Needless to say, I am basically not allowed to touch power drills in my home any more. Now back to the audio gear… I was quite relieved to hear that Bill would be sending me a pair of assembled Prometheus Black’s. I was not prepared for the size though. These are the biggest speakers I have ever used. They came it two parts, the upper open baffle part housed the Bastanis 12” full range driver and a 1/2” horn super tweeter. The bottom half housed a 12” subwoofer and accompanying amplifier. The bottom cabinets were quite heavy as well at about 75lbs each. This was all delivered in 4 large boxes to my Brooklyn apartment. Fortunately, once set up in the apartment, they don’t look too big, but certainly very imposing in their all black dress. Contrast them with the relatively tiny gear I am driving them with, and they look even bigger than they should. As mentioned in the into, I am running them off of the Red Wine Audio Clari-T at 6 wpc… more than plenty power as I never turned the amp’s volume knob much past 1/3. At that same RMAF show I mentioned above, it was also reported that the Red Wine Audio’s Clari-T and the Prometheus were making beautiful music together in another room. I had wanted to review the Clari-T since hearing of them from Louis of Omega Loudspeakers back when I did the 47 Labs Gaincard and Omega Minuet review. Bill from Bastanis also recommended I contact Vinnie Rossi from Red Wine Audio, so I did and very quickly Vinnie sent me over a custom Clari-T with an extra set of RCA outs to feed the Prometheus’s subwoofers. Ya know, I am yet to meet a “meanie” in this business. So far everyone I have dealt with in doing reviews for Dagogo has been incredibly nice, helpful, knowledgeable. Bill from Bastanis U.S. also sent me a complete Bastanis cable loom with interconnects, power cables and speaker cables. They are very nice, high-quality cables. To round out the system with a source, I have been auditioning the Original CD-A8T CD player imported by AAA Audio. As a system, and a fairly affordable system that’s absolutely a pleasure to use and hear, the Original CD-A8T CD player to the Red Wine Audio Clari-T integrated amplifier to the Bastanis Prometheus Black loudspeakers with a Bastanis cable suite, in my Brooklyn apartment, made beautiful, and I mean beautiful music together. The sound was so three-dimensional and room filling. It had volume and weight. It had air and detail and ambience galore. Instruments sounded live and real and created a surreal illusion of the actual thing. The height of the Prometheus speakers enhanced the vertical sound staging and that really created a more realistic illusion of a real space or a stage. Maybe due to the horn super tweeter, the cymbals came from high up where they were supposed to on a real drum kit. They did not seem to be on the same vertical plane as the rest of the drums. The kick was low in height, the snare in the middle and the cymbals up high. This trait, in combination with the real weight the stereo subwoofers supply and the texture and dynamics provided by the 12” full range driver coupled to the open back radiating sound, created possibly the most live and convincing illusion of real musicians performing in a space that I have ever heard from a pair of loudspeakers. Listening to Charles Mingus, Jazz Portraits, Mingus in Wonderland, all of these described traits were expressed at their fullest. I close my eyes and I am taken back to the time… I’ve said this before in reviews. The time-machine effect, the back-in-time effect was so strong with this system and these speakers. Stronger than other systems I have had. This back-in-time illusion can be better than drugs! And it takes a real good system to make it happen. Now, the speakers are just part of this system and the illusion it is creating. Man oh man, if this little Red Wine Audio Clari-T amplifier isn’t just a giant bargain. A real find. I love its simplicity. Just one input, one volume knob. Just switch it on. No noise. No noise whatsoever! Seriously, saying it is quiet doesn’t do justice. How can something that exhibits absolutely no background noise be described as quiet? If a tree falls in the woods and no one is around to hear it, does it make a sound? Kidding aside, it is devoid of any mechanical noise, and these highly efficient (100db/1watt) Prometheus speakers, especially with the super tweeter, would reveal any noise if there were some. Most of my time with this system has been with the Original CD-A8T CD player as the source. I also put my trusty Eastern Electric Minimax CD player in as source for a while. I mention this because with the Clari-T and Prometheus speakers, it was extremely easy to hear the differences between these two sources. Meaning the amp and speaker combo was revealing and clear. Because the CD-A8T has two sets of outputs, one for the tube output and one for the solid-state, it was more like having two different sources in the system. I think especially for rockin’ tunes, the solid-state output of the Original CD player was a real synergistic match with the Clari-T and Prometheus speakers. I found the tube output of the CD-A8T to be a little better for music like the Mingus recording I wrote of earlier… more live/less rockin’ music. It’s awesome to have the ability to choose the character of output on a source like this. However the option is a manual one… you must move the RCA’s to the different outputs on the back of the unit to change output type. The Original CD-A8T has a very grounded sound with its solid-state outputs. It is very controlled yet tuneful. I found it to be quite neutral again in solid-state mode. I have heard it also in my Rogue system with various speakers in for review and it has held its own against my fav Eastern Electric MiniMax. The Original CD-A8T in solid-state reminded me of the Roksan Caspain which I liked so much when I had it in for review last year. As I mentioned before, I found the tube output to be good for certain types of music. The sound through the tube output is a little less grounded than through the solid-state output. Sonic images through the solid-state outputs were very focused and aligned. Through the tube output they were a little less defined. The tube outputs added a bit of high-frequency sheen that worked well with older recordings. It was also a little more ambient which also worked well with certain kinds of music. Four Philips head screws hold down the top cover revealing fantastic quality inside as well. The tubes (two Electro Harmonix 12AU7’s) are easily removable. Perhaps tube swapping would help bring some more cohesiveness and focus to its output. I plan to find out. Without a doubt, the Original CD-A8T is a fantastically built and classy-looking product, in different materials of black, with a beautiful button layout in contrasting brushed aluminum and a nice center plastic plate that is backlighted with blue LED’s. The unit also comes with a heavy all- metal black remote. Class all around! Way more class than the $698 list price would reveal. I’m telling you… the physical form and build quality of this CD player is equal to ones costing $3k. Seriously. It’s heavy and finished impeccably… very stylish. The sound quality, especially in solid-state output, rivals other solid-state CD players costing at least twice as much. For a sub-$700 CD player, this player’s solid-state output alone is worth twice the price, the build is worth 5x the price. Back to the music… Listening to Bloc Party’s Silent Alarm, there was terrific drive and impact with the Original CD-A8T using the solid-state outputs, Red Wine Clari-T, and Prometheus Black. The album is not very dynamic, and in that trait, very true to its 80’s derivative sound, the likes of APB, Echo and the Bunnymen, Joy Division. The “ORB” system (Original, Red Wine Audio, Bastanis) really brought this high-energy, slightly-dark, mostly artsy, and most certainly driven music to life. You wanna hear it loud for maximum effect… this system with the 6 watts of battery power in the Clarit-T combined with the 100db sensitivity of the Prometheus speakers, and using my room practically as a megaphone, could get loud enough as to rival a Who concert in the 70’s! I prefer to listen in general at moderate levels, usually less than live levels. And the full-range sound of the entire system really allowed me to enjoy the full expression of the music at a comfortable volume. The bass was always full and rich. The instruments always had texture and dynamics. And the ambiance, both low and high frequency, was there as well. On of the best sounding and most beautiful pieces of pop music I own is The Blue Nile’s Hats from 1989. Originally released on Linn’s (yes, the audio company) record label. Hats is very minimalist music, synthesizer laden with quite unique and intriguing and engaging vocals. Paul Buchanan is the vocalist and he has quite the deep honest voice. The album is incredibly atmospheric… reminiscent of a damp, wet, dark and urban place (maybe because the musicians hail from Glasgow). This is not live music by any means, being mostly electronic in instrumentation. But couple the reverberant ambience of the recording with the open-rear baffle Bastanis Prometheus Blacks and you have the making of a real cinematic experience. You don’t need surround sound with these speakers. They involve the entire room and surround you with ambience. All of this ambience and room-filling sound would be too much in my opinion, if not fed a real pleasing, well-rounded, quality source. To understand where this trait was coming from, I tried alternate amplification as well as alternate CD and analog sources with the Prometheus speakers. Without a doubt, the Red-Wine Audio Clari-T is, as others have written, a match made in affordable audiophile musical heaven. I found the Clari-T to be a very courteous partner. The Clari-T seemed to let the source lead. The Clari-T did not impart any negative qualities on the source. It seems to have a wonderful ability to add a little bit of naturalness to the equation. As I mentioned above, there is no added noise whatsoever… which enhances that impression of naturalness and courtesy. I believe that naturalness has all to do with removal of the “nasties” that come from other amplification styles from the equation… due to the Clari-T’s battery power supply. Gone was any electronic haze, grit or grain. Heightened was the sense of dynamics, impact and detail. Gone was any sense of solid-state dryness or forced frequency extremes . Heightened was a sense of coherence and liquidity. All levels of musical information came through along the entire frequency range. The sonic images were full, realistic, and robust especially through the Bastanis Prometheus Blacks. The music through the Clari-T flowed uninterrupted and naturally. I look forward to hearing this amp with other efficient speakers, such as the Audio Note AN-E’s or a pair of Omega’s, whom Vinnie from Red Wine Audio works closely with. As you can tell, I am a big fan of this little amp. I think this is a real bargain of a piece that makes real music. I would not hesitate to own this amp for any fantastic music making system. It’s small, simple to use and really musical. Let me start to summarize with some more comments on the Bastanis Prometheus Blacks… the stars of this system. And I’ll start by getting my one peeve about these speakers out of my system (pun not intended). I am not attracted to these speakers visually. Strictly visually! I’ll just be direct and say that right now. In all black, with their physical dimensions, they are simply too much… too big, to imposing visually, not attractive in form. The real wood options help a lot as you can see for the photos. But in my opinion, so much more can be done to the physical shape of these speakers as to make them much more acceptable visually. This is not a personal taste thing… OK it is, but many other visitors have commented even less politely. OK, that’s out of the way. Sonically however, the Bastanis Prometheus loudspeakers are wonderful. They engage the whole room. They create a huge soundstage. They are full-frequency. They are easy to set up. They have texture, detail, and air. They are musical and tuneful. They play very loud and very soft… and still manage to keep tons of detail, resolution, dynamic range and full-frequency even at low-medium volume levels. Horns sound like horns, synths sound like synths, synth-horns sound like synth-horns. Drums have an incredible illusion of real kits, right there, at the end of my room. 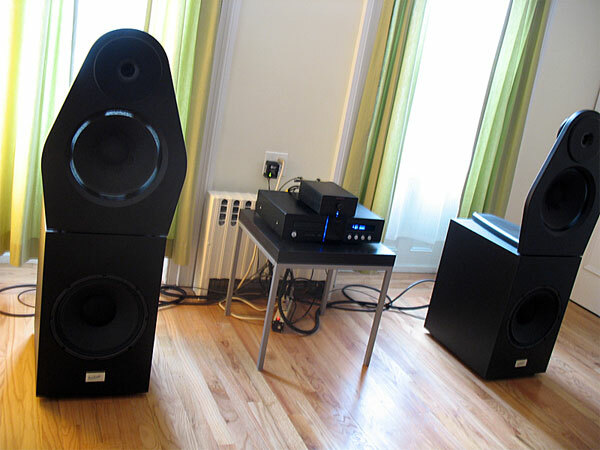 The Bastanis Prometheus loudspeakers, in this system, are very neutral and true to source. They are transparent, which is a quality I have not experienced much in speakers. In my opinion, speakers add their own flavor to the system, more than any other component. These speakers seem to get out of the way and let full range music: tones and textures… come through, as you would believe they should. The Prometheus neither sweetens nor enhances the output. They simply let the source shine through in as big a way as possible. That’s why in this system in for review: the Original CD-A8T CD player, the Red Wine Audio Clari-T amplifier and Bastanis Prometheus loudspeakers (the ORB as I like to call it.) make for an affordable match made in musical heaven. For a grand total of probably around $5500 including all cables (which are fantastic by the way), you will get an absolutely full-range, room transforming, unique as hell system that makes absolutely beautiful and natural music out or all kinds of subject matter. This is the kind of experience I signed up for when writing for Dagogo… the chance to learn new things, experience new experiences, expand my audio horizons, meet great people in the industry. But most of all, get closer to, and at the same time, swept away with the music.